When automakers consider ways to reduce their carbon footprint, they leave no stone unturned. Evidence of this can be found in Ford revealing that the all-new Ford Transit utilizes a forward-thinking two-wet monocoat paint process whose results are not only more durable, but also better for the environment. The Transit, which is being built at the Kansas City Assembly Plant, is the first vehicle to utilize Ford’s two-wet monocoat paint process. The paint, as has been proven in durability tests, stands up to everyday perils such as chipping, scratching, pollutants, and sun exposure. The new paint technology is shown to help the Transit retain 90 percent of its gloss after four years in service; paint applied in standard monocoat processes generally retains about 1 percent of gloss in the same span of time. 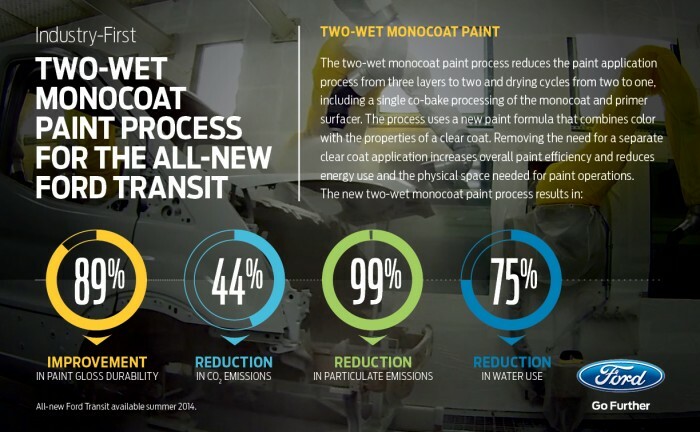 Further, the two-wet monocoat paint process uses less energy and water than standard monocoat paint processes while reducing carbon dioxide and particulate emissions. Ford expects that the process will result in 9,500 fewer tons of carbon dioxide emissions and a 35-ton savings in particulate emissions annually. Combined with a dry scrubber system that is expected to save 10.5 million gallons of water a year, the new paint system is expected to save around 48,000 megawatt hours of electrical power. The new procedure—utilizing a quick-dry primer, a color coat that eliminates the need for a clear coat, and enamel oven curing—is used on white-colored vehicles, which accounts for more than three-quarters of all Transits being produced. Ford says that it will consider using the new paint technology for different colored vehicles on an on-demand basis. Efficiency also aids effectiveness, as the new paint technology streamlines the process and allows the Transits to be manufactured more quickly.